Classification after McKenna & Bell 1997. Bajpai, S. and D. P. Domning. 1997. A new Dugonginae sirenian from the early Miocene of India. Journal of Vertebrate Paleontology 17:219-228. Domning, D. P. 1988. Fossil Sirenia of the West Atlantic and Caribbean Region. 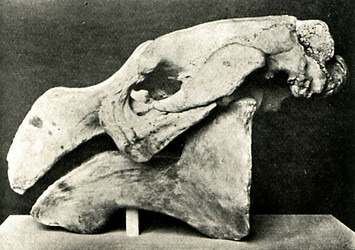 I. Metaxytherium floridanum Hay, 1922. Journal of Paleontology 8:395-426. Domning, D.P. 1997. Fossil Sirenia of the West Atlantic and Caribbean region. VI. Crenatosiren olseni (Reinhart, 1976). Journal of Vertebrate Paleontology 17:397-412. Domning, D. P., G. S. Morgan, and C. E. Ray. 1982. North American Eocene Sea Cows (Mammalia: Sirenia). Smithsonian Contributuions to Paleobiology 52. Smithsonian Institution Press, Washington, D.C.
Rainey, W. E., J. M. Lowenstein, V. M. Sarich, and D. M. Magor. 1984. Sirenian molecular systematics including the extinct Steller's sea cow (Hydrodamalis gigas). Naturwissenschaften 71:586-588. Rowlatt, U. and H. Marsh. 1985. The heart of the dugong (Dugong dugon) and the West-Indian manatee (Trichechus manatus) (Sirenia). Journal of Morphology 186:95-105. Dugong Conservation and its Limitations. Ministry of Agriculture Malaysia.